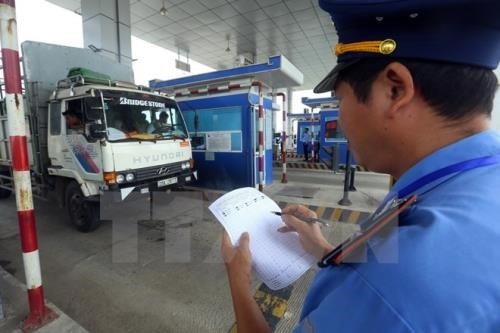 NGHỆ AN — The Ministry of Transport on Monday slashed toll by half at two toll stations on the Bến Thủy Bridge for residents from some areas in Nghệ An and Hà Tĩnh provinces, the Lao Động (Labour) newspaper reported. Type 1 and Type 2 vehicles owned by permanent residents of and organisations/enterprises headquartered in the central Vinh City, Nghệ An Province’s Hưng Nguyên District, and Hà Tĩnh Province’s Nghi Xuân District and Hồng Lĩnh Town are eligible for reduced toll charges at the Bến Thủy 1 and Bến Thủy 2 toll stations, as per the document signed by deputy transport minister Lê Đình Thọ. Type 1 vehicles include buses with less than 12 seats, trucks weighing two tonnes or less and public coach buses. Type 2 vehicles include buses with 12 to 30 seats and trucks that weigh two to four tonnes, the document said. The reduced fee comes into effect on April 15. The transport ministry has asked Civil Engineering Construction No 4 Joint Stock Company (Cienco 4) to complete necessary procedures, calculate financial implications in accordance with the adjusted fees and submit a report before April 10. The People’s Committees of Nghệ An and Hà Tĩnh provinces are responsible for directing local authorities to collaborate with investors and enterprises to identify vehicles eligible for fee reduction, for developing solutions to ensure traffic order and safety, and for ensuring there are no traffic jams because of toll collection, the ministry said. Cienco 4, an investor of the two Build-Operate-Transfer (BOT) toll stations, was reportedly collecting toll from vehicles that were not using the BOT sections.